[The shopping trolley] is a complex sociological phenomenon that has totally changed the commerce and culture of America and the world. Abandoned shopping trolleys are everywhere once you start looking out for them, littering the streets like grimy analogues of the sun-bleached skeletons of imaginary deserts. What do they signify, these forsaken machines of the retail hunter-gatherers? If a fully laden trolley is a symbol of consumer affluence and the market economy’s superabundance, then an abandoned one must be its opposite. 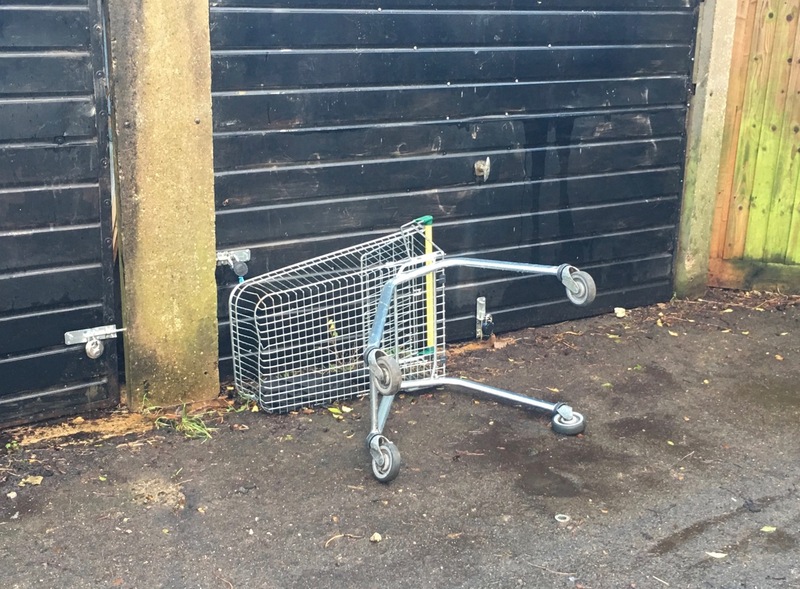 If an empty trolley in the supermarket forecourt is a cornucopia-in-waiting, ready to be plenished, then an abandoned one has lost that potential, perhaps for ever. The arrival of the shopping trolley supercharged the rise of the supermarket. The first trolley was introduced in 1937 by Sylvan Goldman, owner of Oklahoma’s Humpty Dumpty supermarket chain. Goldman had noticed that the loaded weight of the wire baskets in his stores put an upper limit on what his customers could spend. Put a much bigger basket on wheels and it would be filled, he conjectured, thereby increasing his sales. Goldman was eventually proved right, though it took a while: women felt they’d done enough pram pushing without having to do it while shopping, and men thought the device effeminate. In 1960 the Croydon branch of Sainsbury’s unleashed the trolley on British shoppers. Half a century later, the ‘weekly shop’ had become a major logistical exercise for many families, the central activity of the weekend, as supermarkets car parks filled with more 4x4s than a grouse shoot. Roland Barthes wrote that the plays of Racine were ‘an empty site eternally open to signification’. He could have said the same about shopping trolleys. Is an abandoned trolley a sign of hyper-consumerism, a container treated as disposable as a plastic carrier bag once it’s been emptied? Or has it been cut loose from its forecourt mooring as an act of theft, vandalism, or anarchic protest? 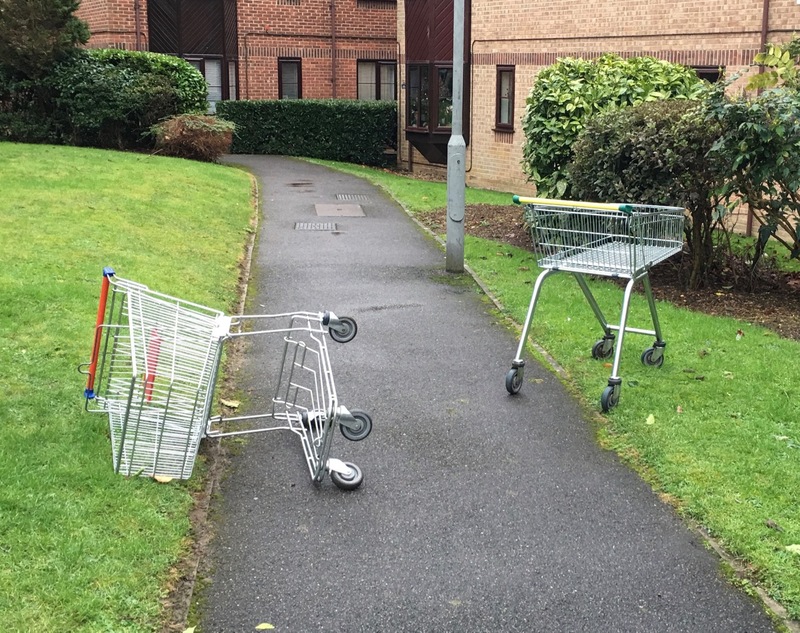 At its simplest, the abandoned trolley seems to speak of urban decay and disillusionment, of the emptiness of consumer society and the exclusion of the poor. If there is a symbolic scale for this kind of thing, then it warrants double points if the trolley is upended and quadruple points if it has become a water feature. While the land-based trolley can be recovered and rehabilitated, the one in the river or canal is beyond redemption, a floating signifier that’s sunk, a momento mori for the retail age. 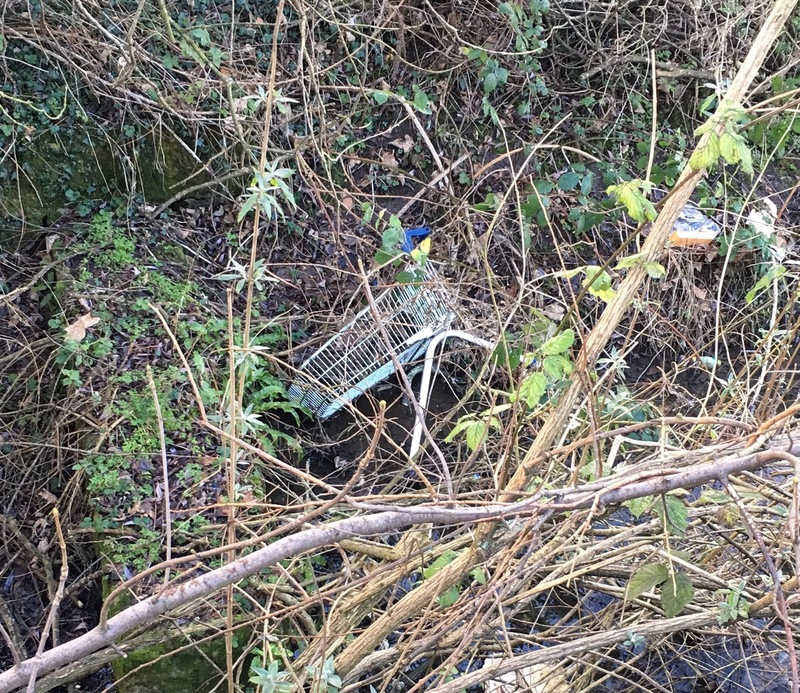 PS Shopping trolley aficionados may be interested in my post on Thomas Rothschild, which pays tribute to his Herculean effort in recovering 47 trolleys from the River Biss in a single day.